…run to the store and buy some Pimm’s! We’re making the ultimate summer cocktail right now. It’s super refreshing. I swear. Get out the chips and the hummus and the fruit and the almonds. Put on some fun music (I can’t tell you my version of “fun” or you’ll never admit to our invisible internet friendship again) and take a seat. Preferably under some bubble lights on a hipster-y picnic table underneath two beautiful yet humongous trees. Loooook at all this summer stuff. Summery stuffy. So much fruit and veg! It’s going in our drink. In our cocktail of a drink. It’s basically a salad in our beverage. Soooo. I mean we’re supposed to be eating color and all that jazz. And last summer, one of the items on my bucket list was to make strawberry pimm’s cups for the blog… but I was totally knocked up. So that wasn’t happening. Pimm’s is sort of fruity and kind of spicy, and I believe it’s gin base, but no, it does not taste anything like pine needles. Have you tried it? Do you love it? Do you hate it? The versions we were drinking a few summers ago had lots of cucumber, lemon and lime. I wanted to keep those flavors but add an insane amount of strawberries and maybe even a little fresh mint. Because I must clutter my life. This is why “trashed up” will be on my tombstone. I soaked the juiciest strawberries in Pimm’s overnight in my fridge. It’s totally not necessary but I used both the liqueur and the berries in the drink and LOVED them. I also used ginger beer instead of ginger ale because it’s always what I would choose. Spicy and sweet! And refreshing! It sounds like there is loads going on – and there is – but it works. It tastes like sunshine and hot days and ice cubes. I’m dying to know all the things, so what is your summer cocktail of choice going to be? Suprisingly enough, I’m also liking the sound of a gin and tonic with lots of lime. Or maybe something with grapefruit and gin. Whyyyyyy am I even entertaining the thought of gin? My grandpa drinks gin. I guess drinking gin would go well with my summer playlist. To make a pitcher of Pimm’s, I multiplied the cocktail by four but shoved in as much produce as I could. It’s absolutely so.freaking.delicious. Below you’ll find my perfect Pimm’s cup, but I suggest playing around with flavors and rations of Pimm’s to ginger beer (or ale) to see what you love. And maybe add other herbs or fruit or even a jalapeno or something! Get weird. Note: to make the pitcher, I used this recipe x 4. 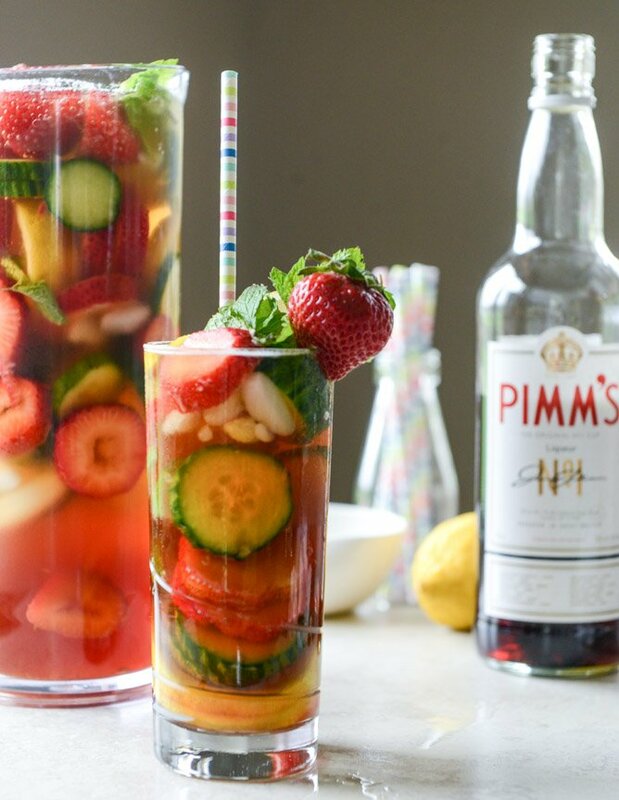 Note #2: like any drink, you might want to taste the Pimm’s or start with an ounce less the first time making this. You can always add more! Before: in order to make these more “strawberry-y,” I soaked a pint of strawberries in Pimm’s overnight in the fridge in a mason jar. I used the Pimm’s for the drinks and also put the strawberries in the drink too! You don’t HAVE to do this. Fill your glass with a mixture of ice, strawberries, cucumber slices, fresh mint, lemon slices and lime slices. Remember to save a strawberry or some mint for garnish on top if you care. I like to to layer this: add some veg on the bottom, then some ice, add some strawberries and lemon, add more ice, etc. Once your cup is full of ice and produce (ha), pour in the Pimm’s and squeeze in the lemon juice and lime juice from each wedge. Use a knife or cocktail stirrer to stir the mixture up and at this time, I sort of faux “muddle” the mint too. Pour the ginger beer over top and finish with the club soda. give it a gentle stir. Garnish with the leftover mint or strawberry or lemon wedge. Drink up! summmmmmerrrrr. P.S. please share your not-85-years-old summer playlist. please? There is also a Blackberry Elderflower Pimm’s. With it I use Lemoncello, soda water, fresh blackberries with a sprig of mint.